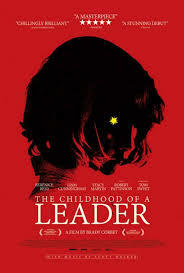 Like Quentin Tarantino's recent film THE HATEFUL EIGHT, THE CHILDHOOD OF A LEADER is presented as an old-school road show epic. It opens with a tense overture showing the end of WWI, including lots of shots of grateful Europeans holding up “vive Wilson” signs. The overture culminates in our first glimpse of the future despot of the title, Prescott (Tom Sweet), dressed as an angel for a church Christmas play. But this child is anything but angelic. More like a bad seed. And I suppose we see that playing out again, as Prescott's mother (Bérénice Bejo), nanny (Yolande Moreau), French teacher (Stacy Martin), and the Priest at his church (Jacques Boudet) all fail to guide this troubled young man down the righteous path, frequently excusing and coddling him instead. As realized by Brady Corbett's direction (from a script he co-wrote with Mona Fastvold), it all adds up to an enthralling cinematic experience that nonetheless fizzles out by the time Prescott becomes an adult dictator, also played by Pattinson. The frenetic score by Scott Walker adds a sense of importance and urgency to the proceedings. It's a compelling and highly watchable film, but one that isn't nearly as important or revelatory as it seems to think it is. 2 ½ out of 4 stars.